The following is an announcement from one of our affiliated unions, the Singapore Organization of Seamen (SOS) for the attention of Filipino seafarers and former seafarers. The SOS is a Singapore-based maritime trade union representing Ratings working on board the ships covered by SOS Collective Bargaining Agreements (CBAs). 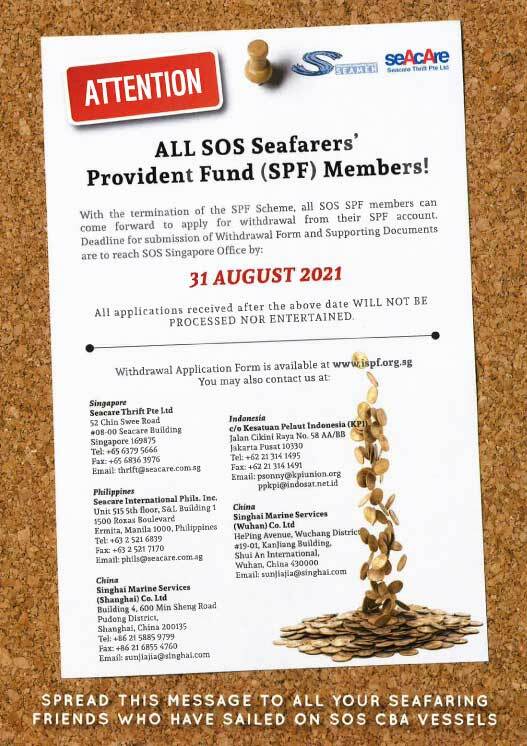 The SOS Seafarer’s Provident Fund (SPF) was a retirement savings scheme set up by the SOS in year 2000 to enhance the welfare of seafaring members. In June 2012, this SOS retirement scheme was terminated and discontinued. Thereafter or beginning 2013, the scheme manager, Seacare Thrift Pte Ltd (STPL), began disbursing the SOS SPF monies back to members. AMOSUP would like to assist its affiliate union – the SOS – to reach out to more seafarers or former seafarers who have been members of the SOS SPF, particularly those who have sailed on board the ships covered by SOS CBAs from year 2000 to 2012. Kindly come forward and inquire with the SOS as you may have SPF balances to be withdrawn. Please forward all inquiries on the SPF to the following email address: thrift@seacare.com.sg or the website: www.ispf.org.sg. The ultimate deadline for submission of claims and requirements is on 31 August 2019.